First, can we please laugh at my risotto photos? It’s quite a challenge to take pretty pictures of something that is of beige and brown hues, with a creamy texture at that, without it looking like a pile of blech! And that explains the contrived placement of the asparagus – that’s me trying to be all fancy dancy because I was grasping for straws. I also decided to say hello through the fork’s reflection. Hi. 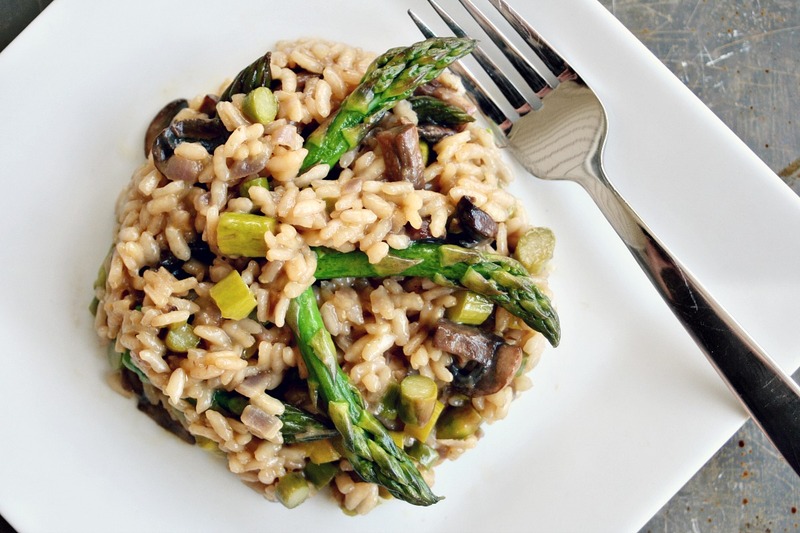 I’ve made this risotto dish several times now and it’s always been a scrumptious hit. It’s creamy, flavorful, and the kicker with this particular risotto? I substituted the usual white wine for a traditional lager. I have to give big thanks to Gennaro Contaldo and his wonderful YouTube video where he shows viewers how to make risotto four ways. Watching how he casually but so elegantly puts the dishes together was what gave me the confidence to go ahead and give it a whirl. He is, in it’s truest definition, fantastic! And Jamie Oliver is his protégé and I do love my Jamie! In addition to beer, I added red onions, asparagus, and cremini mushrooms to my dish. Asparagus is my favorite veg these days, and cremini mushrooms own the mushroom kingdom in my humble opinion. Melt 2 tablespoons of butter in a saucepan over moderate heat. Add the red onion and simmer until the onions sweat - approx. 3-5 minutes. Stir in the arborio rice and toast, stirring constantly, for 3 minutes. Add the beer, stir, and add 7 oz of the vegetable broth. At this point, you're going to stir constantly for the next 10 minutes. The arborio rice will gradually soak in the liquids and become creamy. After 10 minutes, add the mushrooms, asparagus, and the remaining 7 oz of liquid. Stir constantly for another 10 minutes. Once the 10 minutes is up, remove from heat. Add 1 tablespoon of butter, asiago cheese, and stir to mix. Hi Jennifer — this recipe serves two. Thanks! I’m hosting a beer themed party this weekend and will be making this dish.